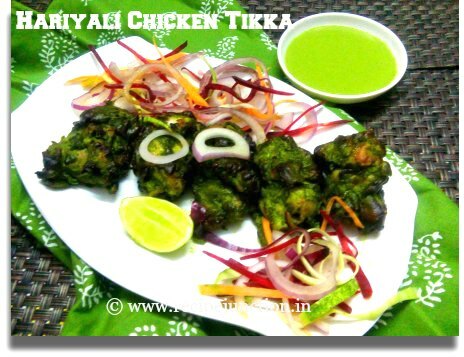 Chicken Tikka or kebab is one of the famous starter or appetizer in any Indian restaurant or parties. 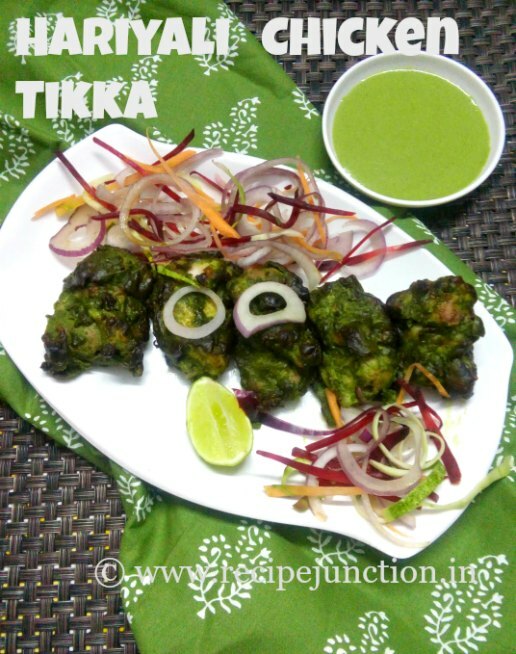 There are quite a few varieties which are equally popular, like Malai tikka, Hariyali tikka, Reshmi kebab etc. 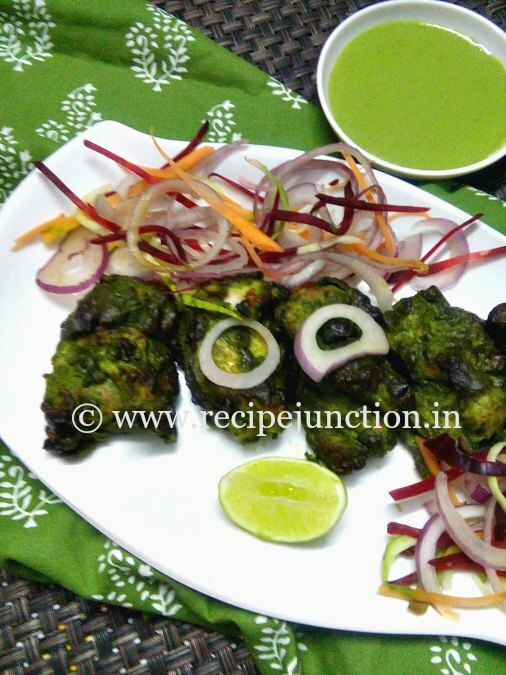 My whole family are very fond of these kebabs , so I often make these kebabs at home on special occasions or on demand by kids. I posted Chicken Malai Tikka already but never posted Hariyali Chicken Tikka, so thought to post the recipe today. In Hindi, Hariyali means green and in this recipe small chicken breast pieces are coated with fresh mint and coriander leaves paste along with some other spices and grilled on fire for that smoky flavour. The mint and coriander paste gives a beautiful green color and nice flavour to the grilled chicken. 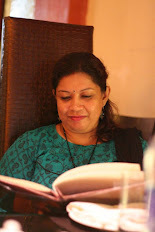 Just love them with green chutney and some salad by the side. There are many ways you can make soft and moist Chicken tikkas at home. You can cook the chicken in oven and then keep under grill for 5-10 minutes to get the grilling effect. Chicken gets cooked well and stay moist that way. Second option, you can grill the marinated chicken tikkas on a grill pan directly. Third option, You can also make tikkas in Air Fryer too. Chicken cooks faster and needs less oil but I found that Chicken doesn't stay much moist when cooked in Air Fryer. Therefore, I love to prepare my chicken tikkas in Oven first and then I keep them under grill option for 5 minutes on both sides. Chicken breast or boneless chicken pieces : 500 gms. Thick yogurt/curd : 2 tblsp. Coriander powder : 3 tsp. Wash the chicken pieces, drain on colander to remove the excess water. Then take a big bowl, marinate the chicken pieces with oil, salt to taste, turmeric powder, cumin and coriander powder and ginger-garlic paste for for 15-20 minutes. Keep aside. Meantime, prepare the green paste. In a mixer, take all mint and coriander leaves and green chillies, make a smooth paste using less water as possible. Keep aside. In the marinated chicken, add green paste, kasuri methi, curd and cream. mix everything well. Keep it marinated longest time possible, 6 hours to midnight if possible. Keep the marinated bowl of chicken in refrigerator if marinating for more than 1 hour. After marination, on an oven-proof tray arrange the chicken pieces nicely coated with marination. Pre-heat oven on 190 degreeC. Drop little oil on every piece of chicken and bake for 30 minutes. After 30 minutes, flip the chicken pieces, drop little more oil and bake for another 30 minutes. By this time, chicken will be cooked but won't get that burnt look. To get the burnt look, turn the grill mode on in your microwave oven or grill. Grill for 5 minutes on each side of the chicken. Serve with freshly made green chutney and some thinly sliced cucumber, beet, carrot and onion slices. Lemon juice : 1/2 tsp. Vegetable or any white Oil : 1 tblsp. Wash and clean the coriander leaves and mint leaves and set aside. Take a blender/mixer and add in all the ingredients except the oil to the blender. Grind everything together without adding water. Blend till smooth. Add in the sunflower oil or vegetable oil. Taste for seasoning. Give it a mix. Store in an airtight container in the refrigerator for up to 3 days. You can use this chutney for sandwiches, pakoras or kebabs etc.